The Southside Virginia Regional Technology Consortium (SVRTC), which comprises 25 school divisions, held its tenth annual awards banquet at Longwood University on March 21, 2019. 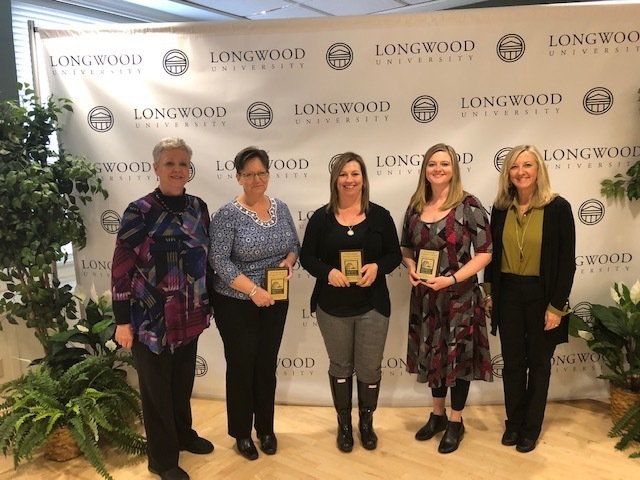 The SVRTC, affiliated with Longwood University, presented awards in several categories to teachers and other public school personnel for their roles in integrating technology into the classroom. This year for Lunenburg County Public Schools, Pamela Berkley, LMS 8th Grade Science Teacher, received the Technology Teacher Award; Sharon Bolan, CHS Librarian, received the Instructional Support Award; and Lucy Hall, Director of Data & Analysis, received the Technology Support Award. The Technology Teacher Award recognizes classroom teachers who advance learning through integration of technology into the curriculum. The Instructional Support Award recognizes a support person who advances a school division’s technology environment by providing crucial instructional technology support. The Technology Support Award recognizes personnel who provide support for the integration of technology into the curriculum. The SVRTC coordinates the acquisition and integration of up-to-date and emerging technologies and training for K-12 students and staff and other citizens to enhance learning and encourage economic development through Technology & Innovative Practices (ITTIP), an outreach of Longwood’s College of Education and Human Services that researches and develops technology-integrated strategies and models, works closely with the SVRTC and its administrative agent. The ITTIP is headquartered in South Boston, Virginia. Copyright © Lunenburg County Public Schools 2019. All rights reserved.